Maud Devolder studied Archaeology (Aegean Bronze Age and Classical Archaeology) at UCLouvain, and Eastern Mediterranean Archaeology at KULeuven, Belgium. In 2009, she received her doctoral degree from UCLouvain with a thesis on “Social components and interactions in Neopalatial Crete. Investigation of the archaeological data (1700-1450 BCE)”. From 2010 to 2014 she was a post-doctoral research fellow of the National Fund for Scientific Research (UCLouvain) and Belgian member of the French School at Athens. She is involved in several archaeological projects in Crete, in Malia (publication of the Palace and of the Building Dessenne), Sissi (Building E in Zone 5), and Palaikastro (Building 5). She has been awarded a Humboldt Research Fellowship (November, 2014 to August, 2016) in the Topoi research group (B-2) XXL Monumentalized Knowledge. 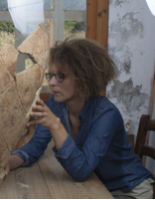 Her work at Topoi will focus on the application of “Architectural Energetics” to Minoan and Mycenaean architecture.